Chicken is such a healthy ingredient, but gets boring quickly. You can season it, chop it up, or stir fry it. But making a stuffed pepper is a creative way to incorporate a vegetable (peppers) into your meal. In addition, a chopped up chicken can soak up marinade flavors from juices and spices. Following this recipe is fairly straightforward. Because the marinade has a second opportunity to absorb flavors while being cooked with the pepper, you can accidentally over-cook the chicken on the stove top without ruining the entire recipe. I therefore consider this recipe easy. This recipe may take longer if your stove top pan (like my cast iron pan) isn't large. Because this recipe requires the peppers and pre-cooked chicken be baked in the oven, it may be a limiting factor in preparing enough for the whole family. You may need to vary the time the pepper is spent cooking in the oven. My first batch, the peppers were not fully cooked (but I had already let the pepper cool down). Even though the meat is cooked with the pepper, it's difficult not to scoop the meat out, leaving an empty shell of a pepper. Then, eating the pepper separately is not so fun, as most of the flavor is cooked into the meat. Since I had extra meat filling when I made this recipe, the leftover meat filling goes well mixed with rice as a separate meal. If you have tortillas, you can make a small taco or burrito. I would definitely do this recipe again, and switch it up. Pre-cooking steak or pork instead of chicken, or a combination of meats is one way to change the flavor. An obvious second way to switch up this recipe is change type of spices for a different flavor. Mix vegetable oil, lime juice, cumin, paprika, salt, a minced garlic together as a marinade. Let the chicken marinate in the marinade for at least 15 minute. Cook chicken on the oven-safe stove top, flipping it halfway through. Saute chopped onions and tomatoes in the same oven-safe pan. Mix the chicken, rice, sauteed onions and tomatoes, and cilantro. Season with additional salt as necessary. Cut the bell pepper length-wise. Clean out the seeds and membrane. Stuff the bell pepper with the mixture from the clean bowl. Preheat the oven to 375 degrees. Sprinkle the Mexican Cheese over each bell pepper. 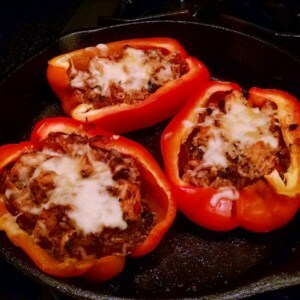 Put the stuff bell peppers back into the skillet and bake in the oven for 20 minutes.